IN RAT Boy’s world, stepping on to public transport is like entering a battlefield – the UK is a land of wannabe gangsters, muggings and sportswear casualties. An Essex boy – real name Jordan Cardy – he says he and his homegrown rap songs are a product of his background. “I hated school, it bored me. I wanted to do something creative, so instead of going in, I made music and art and just hung around,” he says looking back, now aged 19. Life after school for the young Jordan Cardy offered little. After going to art school, he faced a succession of rejections from retail work which finally culminated in him landing a job in a Wetherspoons pub. But under his new alias, Rat Boy found solace in music, teaching himself Logic on his mum’s computer. He says that he had little other choice. “Every week I tried to start a new band but I couldn’t get people to rehearse. So I did everything myself,” he explains. His songs reflect reality from ‘blokes getting a woman pregnant and then not bothering about the kid’ (Sportswear)and the fear of doing the same dead end job for his whole life (Carry On). The tracks are often inter cut with samples from films such as Withnail and I, Scum and Made in Britain. Those films are favourites of his father but still seem relevant in 2015. After sending his mixtape out to any blog he could find, he was offered help by Babyshambles bassist Drew McConnell that led to a single, Sign On, on Hometown Records. His latest release is Fake ID and there will be another mixtape on its way soon. Best of all for the young man, who has never left the UK, is that his new-found notoriety led to him meeting one of his heroes – The Streets’ Mike Skinner. “It was crazy,” says Rat Boy. “When I was six-years-old I knew all of the words to Original Pirate Material and used to rap along to it. 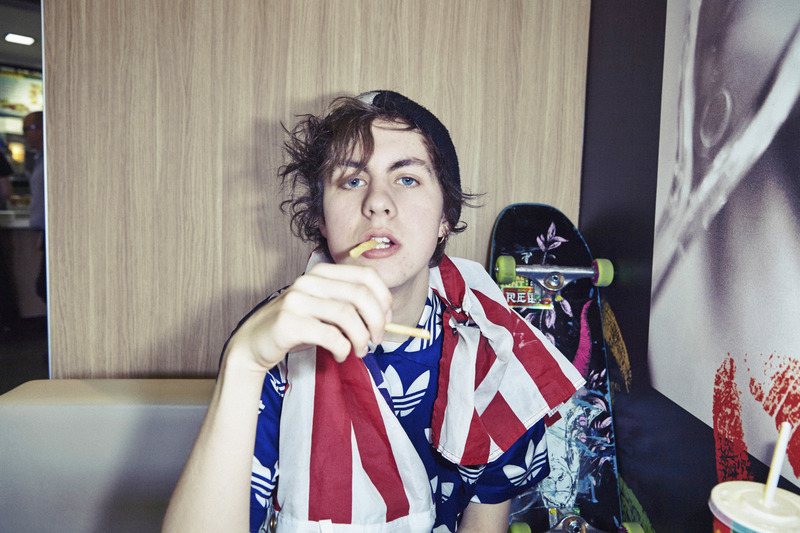 Rat Boy will appear at The Boileroom in Guildford on Monday (September 28). Other upcoming Boileroom gigs include Jim Jones & the Righteous Mind (October 6), Martin Luke Brown (October 7), Barrence Whitfield & the Savages (October 8), Wheatus (October 9), Ruts DC (October 10) and The Woodentops (October 14).